We believe in keeping ingredients simple and pure. Wildthings is made from the highest quality essential oils, which are non-toxic and nourishing for the skin. 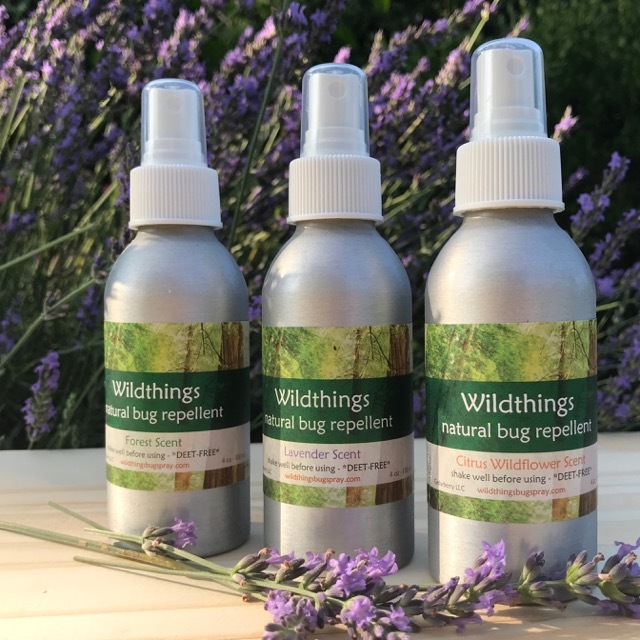 Originally created as a safe and effective bug repellent for my own children, Wildthings is 100% natural and plant-based, and contains no synthetic chemicals, no artificial additives or preservatives. Never tested on animals. Good for your body and good for the planet. Our synergistic blend of potent insect repelling essential oils is combined with soothing plant extracts and distilled spring water for a light, non-greasy mix that mists on easily and smells wonderful. Rose geranium, catmint and witch hazel have been used for centuries as traditional remedies for skin complaints, and they are known for their healing properties. Our essential oils are also commonly used in aromatherapy mixtures to bring a sense of well-being. Working with essential oils means working with some of nature's most divine scents. Wildthings comes in 3 varieties: Lavender, Citrus Wildflower, and Forest, which has a hint of patchouli. Visit our photo gallery of Wildthings (and Wildcat) sightings. Where's your Wildthing? Send us your own photos, we'd love to share them. Wildthings @ Blackwater Falls State Park, WV photo: Martin Radigan. Field Notes are here! These brilliant pocket-sized journals are our invaluable companions, not just traveling, but for every day use. Perfectly sized, soft cover, and thin enough to fit comfortably in a back pocket or the top of a backpack. Use them for sketching ideas, planning projects, jotting down notes, quotes and movies you have to see... We love the ability to flip through thoughts on paper. It's old school, but nothing beats it. Learn about our story and our commitment to a healthier future for our families and the Earth. We donate a percentage of our revenue to non-profit organizations involved in making the world a better place. Discover and support some of the organizations we love.